President Trump has signed an executive order which bans nationals of Iran, Iraq, Libya, Somalia, Sudan, Syria and Yemen from traveling to the US for at least 90 days. Does this ban only include those on immigrant visas or does it also cover regular tourists and other temporary visitors? If so, is there any other way for nationals of those countries to enter the US, such as by requesting a waiver from a consulate? On the 13th of November, the preliminary injunction (which prohibited the US government to enforce the presidential proclamation) was stayed except for foreign nationals who have a credible bonafide relationship with someone in the US. So nationals of Chad, Iran, Libya, Somalia, Syria, and Yemen will remain travel restricted to the US unless they have a parent, including parent-in-law, spouse, fiancé, child, adult son or daughter, son-in-law, daughter-in-law, sibling, brother-in-law, sister-in-law, grandparent, grandchild, aunt, uncle, niece, nephew, and first-cousin. For all relationships, half or step status is included (e.g., “half-brother” or “step-sister”) in the US. Any other extended family members will not count as a bonafide relation. A federal judge has rules the ban is unlawful/unconstitutional and until further notice, the ban is on hold. This means any national of the aforementioned countries, with a visa or green card, can currently travel to the USA. This might change any moment if a higher court rules differently, so if you live in the USA (like with a student or J-1 visa), you should travel ASAP. People holding so-called green cards, making them legal permanent U.S. residents, are included in President Donald Trump's executive action temporarily barring people from seven Muslim-majority countries from entering the United States, a Department of Homeland security spokeswoman said on Saturday. removing individuals with refugee applications approved by U.S. 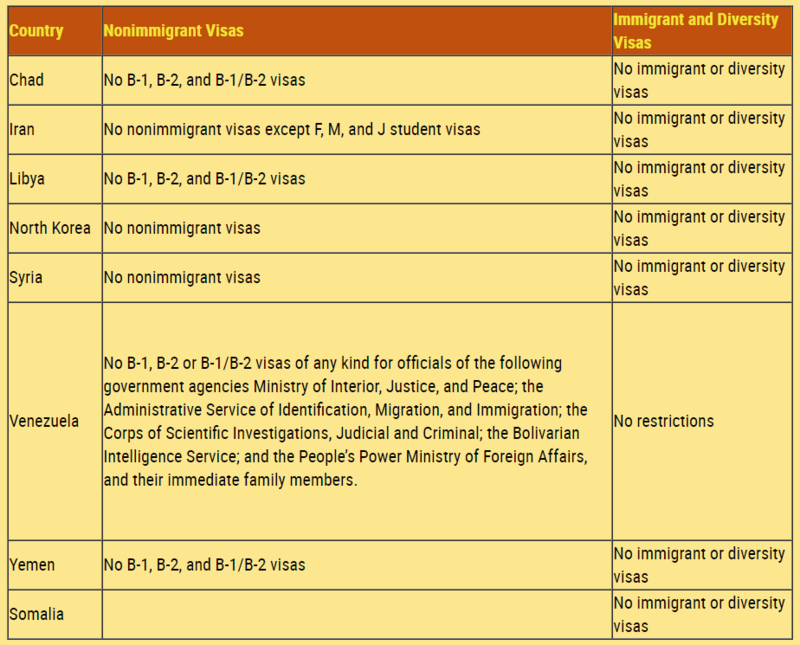 Citizenship and Immigration Services as part of the U.S. Refugee Admissions Program, holders of valid immigrant and non-immigrant visas, and other individuals from Iraq, Syria, Iran, Sudan, Libya, Somalia, and Yemen legally authorized to enter the United States. This does not say that the persons concerned have to be let into the United States, only that they can't be sent back. It is possible they will stay in limbo at the airports until the legal situation clears up further. It is also not clear if airlines will now allow such persons with already issued visas to board flights to the US. Airlines have started to refuse boarding to those holding valid visas from those countries that are on the temporary ban list; and some passengers have been stopped at transit points. Five Iraqis and a Yemeni national were kept from boarding a flight from Cairo to New York on Saturday, despite all seven people having already obtained the necessary migration visas to enter the United States. "We would have liked to have had them fly with us, but it would not have made much sense because they would have been denied entry" to the United States, KLM spokesman Manel Vrijenhoek told AFP news agency. In Canada, WestJet Airlines said it turned back a passenger bound for the United States on Saturday in order to comply with an executive order that prohibits people from seven Muslim-majority countries from entering the United States. WestJet spokeswoman Lauren Stewart said the airline would give full refunds to anyone affected by the US executive order. It did not say which country the passenger had come from. British Conservative Member for Parliament Nadhim Zahawi is now unable to visit his sons who are at Princeton University. He represents Stratford on Avon, The birthplace of William Shakespeare. Zahawi is a British Citizen who was born in Iraq under the rule of Saddam Hussein, from which his Kurdish family fled in 1976 when Zahawi was aged 9. The US State Department said that Britons with dual nationality with Syria, Iraq, Iran, Sudan, Libya, Somalia and Yemen will be stopped at the US border for the next 90 days. British Foreign Secretary Boris Johnson held conversations with the US government on Sunday. The Foreign Office then advised British travelers that dual citizens were only affected if traveling to the US from one of the seven banned countries. Omid Nouripour, a Green Party MP with German-Iranian citizenship, is reported to be one of ten thousands of German citizens believed to be banned from entering the US under new rules. Nouripour is the vice chair of the German parliament’s American-German group and a member of the steering committee of Germany’s Atlantic Bridge programme. Canadian dual citizens might be exempt as long as they travel on their Canadian passport, though whether US immigration will make that distinction in the current uncertainty remains to be seen. U.S. Customs and Border Protection (CBP) has briefed the global trade group that passport-holders from states such as Iran and Iraq, including cabin crew, will be barred entry to the United States, IATA said in an email to its member airlines, seen by Reuters. Early this morning, the Massachusetts federal district court issued a temporary order that restrains the government from enforcing the Executive Order to detain or remove holders of a valid visa or green card who travel from the seven countries to the US through Logan Airport. This order is in effect for the next 7 days. The seven affected countries are: Iran, Iraq, Libya, Somalia, Sudan, Syria, and Yemen. […] We encourage you to fly back to Boston--directly to Logan Airport--as as soon as possible, and before February 4. Two MIT undergraduates who were denied re-entry to the United States last weekend landed at Logan Airport on Friday afternoon. The students are now back on campus. Both were prevented from boarding flights back to Boston last weekend after spending the winter break with their families. The two undergraduates’ return to the U.S. was made possible by a temporary order issued by the Massachusetts federal district court last weekend, restraining the government from enforcing the executive order to detain holders of valid visas or green cards who travel from the seven affected countries to the U.S. through Logan Airport. On Thursday, an airline announced that it would begin allowing passengers affected by the executive order to board international flights bound for Logan. MIT officials moved quickly to get the two students — with whom they had been in regular touch — onto one of this airline’s flights back to Boston. Not the answer you're looking for? Browse other questions tagged visas usa event-based-effects denial-of-entry or ask your own question. Travellers to Massachusetts Who May Be Affected By the Ban, “To Do” Prior to Travelling?